Snow Cover Extent (SCE) for North America now 1 SD below average, but Snow Water Equivalent (SWE) 1 SD above average. It is high SWE that could delay melting in Spring 2019. 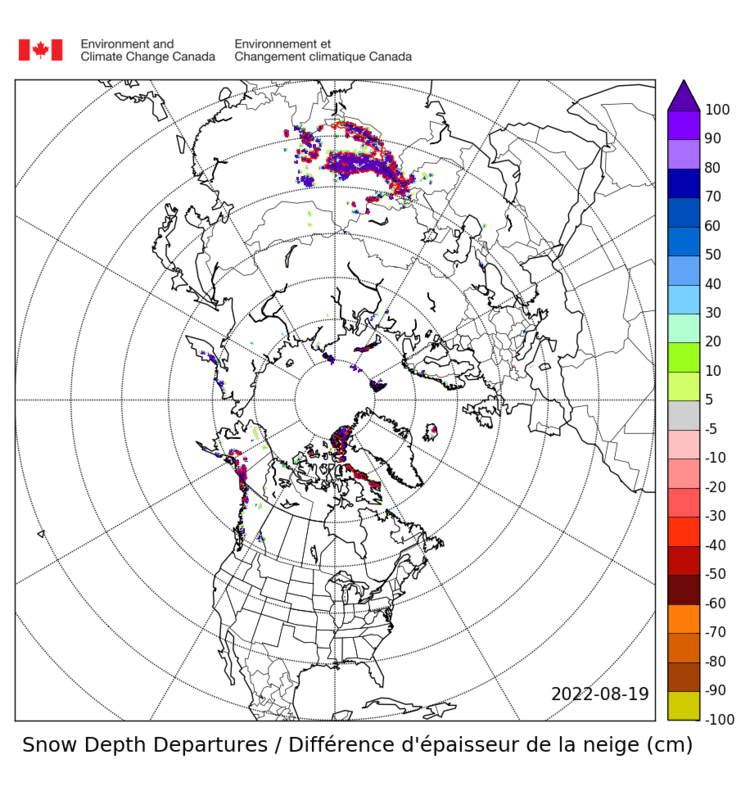 My past research into the behavior of snow cover for several weather stations in NE Canada and in Siberia has shown that thick midwinter snow cover does not correlate much with delayed snow melt-out. It mostly depends on spring weather and possibly on late snows. I will attempt to updare and repost those charts, though producing them was very tedious due to data problems. Snow Cover Extent (SCE) for North America now just more than 1 SD below average, but Snow Water Equivalent (SWE) 1 SD above average. 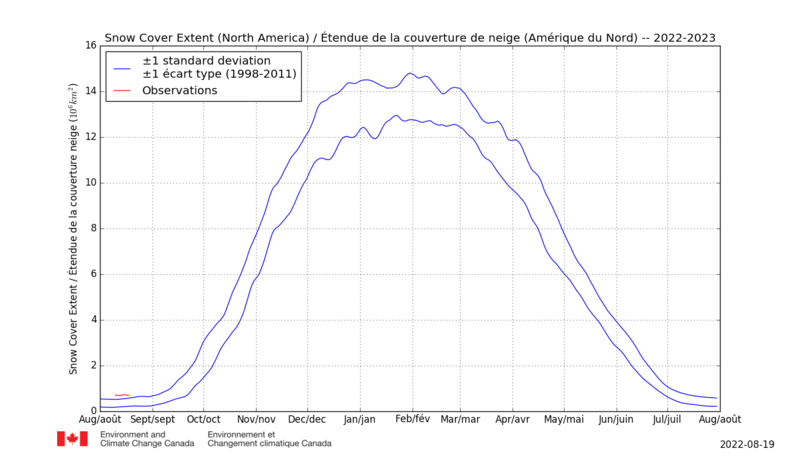 With cold returned to Canada, further retreat of snow cover is unlikely. My guess is that this event is pretty much over. Wunderground.com's guess(?) at temperatures Jan to March in the USA. Looks last last year? Any above-average temperatures will likely be confined to the West and Northwest during the first three months of the new year. Above-average warmth, by winter standards, is expected from Northern California to parts of the northern Plains, with temperatures even farther above average forecast in the Pacific Northwest. "The current magnitude/flavor of El Niño event and expected high-latitude blocking associated with the solar minimum (and backed up by the November blocking) add up to heavily skewed odds toward a colder, stormier late-winter period," said Dr. Todd Crawford, chief meteorologist with The Weather Company. January 2019 temperature outlook from The Weather Company, an IBM Business. "The stratospheric polar vortex has been taking a beating, and there are indications that a significant stratospheric warming event is coming soon, by displacement or split, which may also help to increase probabilities of the sort of high-latitude blocking that would favor a colder late-winter look," Crawford said. Thread has been remarkably quiet. Thought I would post most recent graphs for North America. Snow cover is normal while snow water equivalent is still 1 SD over the average. One thing I had not noticed before is that snow cover is approaching the maximum for the average winter while snow water equivalent is barely half way to the max for the typical winter. And here is last year for comparison. As you can see it was only in February and March 2018 to early April, and only Snow Water Equivalent, that went doo-lally. Remarkable how closely this year is tracking with last year. Would not be surprised if it happens again and, if it does, bbr2314 will be back here with a vengeance. [...] bbr2314 will be back here with a vengeance. Herewith the results of peering into the chicken entrails by Environment Canada for the weather January to March 2019. Warm in the west, cold in the N.E., and mostly average precipitation. Meanwhile, elsewhere are suggestions of a SSW / PSV whatever to cause general weather mayhem in the northern hemisphere this month. Rutgers NH snowcover extent for December was 44.55 million km2. A positive anomaly of 0.57. Regions with above normal extent were mid China, SE Europe. Regions with below normal extent were northern China, parts of the middle of USA and western Europe. It's still a long way out. They predict almost 3 meters of snow for the North-East of the US. The blast of wintry weather across the eastern U.S. has resulted in the 2nd two to three inch snowfall of the season for Chicago. Temperatures reach the mid 30's tomorrow so should be gone in a couple of days. Our warm winters continue. Here in the Detroit area we have had precious little snow also. However, my son down in Dayton and nephews in St. Louis, MO and Lincoln, NE have report an [over]abundance of snow so far this winter. It seems that the recent weather patterns have pushed the snow further south this year. The latest forecast is calling for another round of heavy snow through the mid section this weekend. Graphs from Environment Canada attached. The Eurasia data at the moment suggests an exemplification of the climatic trend, i.e. Snow Cover Extent (SCE) below average (AGW changing snow to rain in lower latitudes), but Snow Water Equivalent (SWE = a measure of mass) well above average as wetter air pushes northwards. North America SCE is at +1 SD above average, while SWE is well above +1 SD average, about 2-3 weeks ahead of an average year. Will it repeat last year's mega snowfalls in February and March? One of the main negative consequences predicted due to climate change is a reduction in spring melts, due to decreased snow packs, and its resultant effect on local agriculture. Does the increased SWE negate that theory at all? I have not heard this predicted. What we are seeing is large positive anomalies for extent in the Fall with negative anomalies in the spring as this snow melts earlier due to warmer springs. Reduced extent means that more southerly spring melt will be less, further north where SWE is high, spring still comes early which means the summers are longer, rivers are lower when it is hot and irrigation is most needed. There may well be more and bigger floods....Make that "There will be more bigger floods". This is incorrect. It depends on the region. What has been unfolding in much of Canada would certainly negate this theory. However, it seemingly holds for most of Eurasia. PS, right on queue, the purples are once again proliferating. Caribou (in Maine) has had its snowiest winter on record to date. Also, Shared Humanity may imminently experience Chicago's coldest temperature on record. It should come fairly close, with a record-low high temperature even more likely (for O'Hare, current record is -27F set 1/20/1985, and record-low high temperature is -11F, set 1/18/94 and 12/24/83). I also don't know where his quote re: below normal snow comes from as ORD is above normal for the season to date, as well. Current output has O'Hare approaching -30F for a low and possibly -15F for a high. Which would smash the old record. Nothing to see here...! This feels more like a "for fun" thread, to me. One where we can confuse weather with climate. Folly, ultimately, but fun. Warmest winter I've yet experienced here in the BC Rockies, with the least amount of snow, as well. This meshes well with my personal local area desertification hypothesis. For whatever that's worth. Are you near Cache Creek by any chance? That local was very reminiscent of low desert regions of Southern California to my eye. I've seen kangaroo rats just southwest of Swift Current Saskatchewan, so that region must have been very arid in the not too distant past. Perhaps a desert stretched north from Death Valley in the rain shadow of the Rocky Mountains? Winters would have been devoid of snow, just to stay OT. Environment Canada have been throwing the bones again - so here is what they came up with for weather Feb to April. Above average temps for most of the Canadian Archipelago and NE Canada - mostly medium confidence. Above average precipitation for the Canadian Plains and Quebec - but mostly with very low confidence. Usefulness in predicting late and end of winter snowfall ? Not-a-lot ? That would, IMO, indicate a blockbuster spring. Warmth in Quebec / Baffin anytime before 4/1 is probably a sign that it is snowing A LOT (esp combined with above normal precip). When your average temp is 20F, even a +10F monthly is likely to yield +++snowfall. Current conditions are already pointing to blockbuster potential IMO, as the purples are once again proliferating. If model output through D10 is correct, gains across much of Canada should continue apace. PS, Caribou continues to smash records. It exceeded 1994's record January total (44.5") on the 22nd. Ended the month with 59.8" of snow. ! Graphs from Environment Canada attached as at 1st Feb.
North America SCE is at (whoops,thanks bbr,) +1 SD above average, while SWE is well above +1 SD average, about 2-3 weeks ahead of an average year. At this point in time there is little difference from the 2017-2018 winter snowfall. Will there be a repeat of last year's mega snowfalls in February and March? bbr is saying yes or YES!!!!. I am not so sure. Canada precipitation looking mostly low over the next 10 days (see last Greenland melt Season post), and some forecasts are saying temperatures will rebound up after a really cold Feb to early March - so no late Nor'Easters. Assuming you meant to say average and not +1 SD above average. I also believe you are correct in that generally warmer winters in the mid latitudes will result in reduced SCE while an atmosphere loaded with additional moisture will result in earlier and deeper snows across the north. He Shared Humanity, in the news there was something about little earth quakes. The result of some freezing in the ground. I think it was in the area of Chicago. Did you witnessed them ? Mixed extent in the U.S.A.
We may even be ahead of 2018 due to much more SWE in the Rockies this year. Snow water equivalent is an interesting way to look at the snowpack, but extent tells whats really going on. With the SWE, it just shows that some areas got heavier snow. Extent is at average, and they already have 300 km3 of meltwater extra. That's 300 000 km2 a meter thick. That will probably have an impact on the beginning of the meltseason if it continues. And they predict plenty of snow in the next days. Graphs from Environment Canada attached as at 14th Feb. Both Eurasia and North America showing SWE tending to attack the top of the graph while SCE is only moderately above average. Cold conditions may persist in parts of the northern Plains and upper Midwest during the first week to 10 days of March as the weather pattern currently locked in place persists. That pattern involves the negative phase of the Pacific North American Oscillation, or PNA. When the PNA is in its negative phase, the jet stream is amplified far to the north over the northern Pacific Ocean. That helps to send a southward plunge of the jet stream into the western states, keeping temperatures colder than average from the West to portions of the Plains. The negative PNA phase also typically means the Southeast is warmer than average. "We do expect negative PNA into at least early March, but a transition to the pattern described by our forecast map by the 10th of the month," Crawford said. "The consensus of our statistical and dynamical model guidance suggests a transition toward a warm North and East and cold South and West pattern in March, especially during the last three weeks of the month," Crawford said. "We've modified our March map along these lines." But Crawford cautioned that there is some concern the negative PNA could persist longer than expected, which would yield colder temperatures than depicted in portions of the West and Plains. Regardless, colder-than-average temperatures are expected from Central and Southern California into the Intermountain West, central and southern Rockies, Desert Southwest and the western half of Texas. The Pacific Northwest, northern Rockies, central and southern Plains, lower and mid-Mississippi Valley and Gulf Coast can expect near-average or slightly colder conditions in March. April is currently not expected to be a repeat of April 2018, when record cold dominated the Plains and the northern tier of the U.S. and Winter Storm Xanto brought record-breaking spring snowfall to the upper Midwest and Great Lakes. The southern tier of the U.S. may see near-average or slightly cooler conditions during the second month of meteorological spring, but the rest of the nation is forecast to have near- or above-average temperatures. April could be a relatively warm month from the Northwest to the northern Rockies, as well as in the Great Lakes, western and northern New York and far northern New England, where above-average temperatures are expected. Above-average warmth is expected across the nation's northern tier, from the Pacific Northwest to New England, during the final month of spring. The best chance for near-average or slightly cooler temperatures in May will be from California eastward to the southern Plains and lower Mississippi Valley. The remainder of the Lower 48 states can expect near-average or slightly warmer conditions. I would not put stock in the Weather Underground forecast, but what do I know. In any case, until April, any "reds" over Newfoundland and Quebec are still likely cold enough to allow for massive snowfalls, with more warmth + moisture than normal combining with temps that are still sub-32F to allow for this. Today's North American increase was stupendous. SWE in Eurasia also very high. The NOAA North American snow extent is now over two standard deviations above average, in Asia about one above and in Europe well below average. However in spring we could still see a crash like in 2012. The Great Lakes are now much colder than both 2018 and 2017. Superior is almost entirely iced. Does anyone have data on annual Great Lakes ice volume since XXXX? I can't find this parceled out specifically but I wonder if PIOMAS or whatever has this information, and I'd be very curious to see the annual graph comparison if it does exist. In any case, continentally, snowfall is now +2SD vs EXTENT normal as mentioned by Tealight, while SWE is chugging towards 1,500KM^3. This year appears to have an edge over 2018 in terms of both SWE, and lake / near-shore sea ice off SE Canada. I think both factors should result in a later SWE maximum than 2018, possibly in the last week of April (last year was 4/15-4/20). This should also have the side effect of a very late Hudson Bay melt-out (later than 2018), also resulting in a protracted melt season for Labrador / Baffin. Maybe that also portends a record early melt-out for Bering and Barentz? We shall see, but curious to see if the pattern development through 2018->2019 continually re-inforces as it has been doing, or reverses at some point, as it eventually will (or so we hope). Finally: the long range ensemble modeling projects continued FRIGID conditions across the Midwest / Great Lakes. This should result in the freezing season for the Great Lakes extending into Mid-March, and beyond. I wish we had the actual data but I'd guess Superior will end up with the most volume of any year in the satellite record. Apparently April 2014 was the latest it has had substantial ice coverage since 1979, and I think that is a record we break with ease if the evolution of 2018's springtime pattern is any guide for 2019. This upcoming pattern could also put us in a position for SWE to make a running leap into early March. Usually SWE growth slows significantly and peaks in March, but this year, I don't think it is going to slow significantly within the next two weeks, and I do not think we will peak until late April. North America has crossed 1,500KM^3 well ahead of 2018. Let's see if we hit 1,600 by the first few days of March. Does anyone have data on annual Great Lakes ice volume since XXXX? I think you may be looking for something that is not there, unless someone takes the thickness data they show on their maps and translates it into volume. The higher snow extent this year should make the snow melt faster because it is spread out more. This is a simple energy transfer law of Volume to SurfaceArea ratio that effects everything. Meanwhile in the UK we have the warmest February on record. The last two weeks were constant strong southern wind and today we reached 20°C in Wales and even 15°C in northern Scotland which has a similar latitude to northern Quebec or central Hudson Bay. I already bought some ice cream this year to cool down during late winter. It is not the extent that is higher. Those plots are of the snow water equivalent. The extent is near average. That would indicate that the snow is heavier, which would take longer to melt. But only covers the years 1966-1979. From the website: "During the winters of 1965/66 through 1976/77, NOAA/Great Lakes Environmental Research Laboratory (GLERL) collected weekly ice thickness and stratigraphy data at up to 90 stations per year on the Great Lakes. Data include station name, latitude, longitude and period of record as well as thickness of up to six ice layers, total ice thickness, snow depth (on top of ice), snow condition, ice condition, and ice type code." In any case, both the years of 2014 and 2015 saw more extensive ice coverage and more extreme "polar vortex" events, so I doubt that this year would be record setting in terms of volume. We are actually just about matching 14-15 in terms of coverage and weather looks colder than both of those years through D10. I think there is a decent chance given the overall state of the continental cryosphere that Superior ultimately outdoes both of those years in terms of melting out. PS: most of Minnesota and Wisconsin just recorded their snowiest February and / or month (ever) on record. RE: Tealight -- both extent and SWE are at records this year (at least SWE is). But I am also pretty sure the SWE differential with 2018 is still greater re: SWE than extent (in terms of %). So it is thicker than any previous year as well. It is relatively easy to add KM^3 to mass regardless, it is difficult to add KM^2 to area after a certain point when coverage extends to most of the continent as it does now. The cumulative albedo differential this February is going to be quite large versus 2000+ satellite data (a day to day comparison shows we are firmly in the lead). At this point there is a massive patch in the middle of the country reflecting about as well & whitely as Greenland. It is now almost 3/1, which means the insolation being deflected is also quite significant, and much more than what Greenland is deflecting at the same moment given the sun's position in the sky. bbr is right about at least one thing: there was a tremendous amount of snow this year in North America, and SWE is above average in Eurasia too. Of course, as the Arctic is becoming more open it is getting wetter as well so this should not come as a surprise. More open Arctic = more rain coming out of the Arctic and hitting sorrounding areas, mainly Siberia and Canada. Here are SCE and SWE for North America (NA) and Eurasia (EU) as at 25 Feb. Also last year for North America. Quite a contrast - EU following the climate models, i.e. 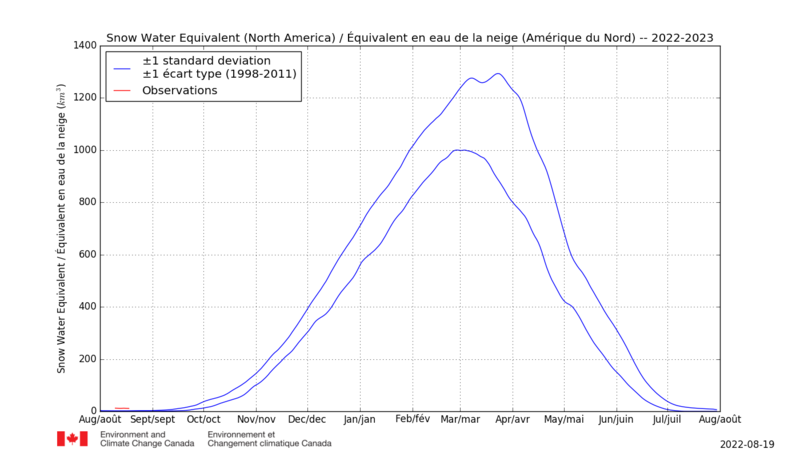 more snow at high latitudes but less SCE as the snowline heads north as the years go by. NA still showing both SCE and SWE increasing variation from the average. Recent forecasts from the US Climate Prediction Centre are in 2 minds about when the current long cold spell will break - mid-March or late March? Given that unseasonable cold and its southerly extent, most precipitation in NA will be of snow. GFS Accumulated precipitation forecast to March 8th suggests continued high SCE and SWE. On Friday might have the Canadian seasonal climate predictions for March April May. It looks like we are about 10% above 2018 which is pretty phenomenal for what was apparently the most recent record year. If we extend the current anomaly to peak, we will max ~1,750-1,800KM^3, vs. a hair over 1,600KM^3 in 2018. However, the anomaly (% wise) could also continue building on current gains for a while longer. We shall see. In any case, today's gain was strong, and we may end February with a volume equivalent to 2018's maximum, with ~40 days to go relative to the 2018 maximum in April. It should be noted that 1,800KM^3 of SWE in early April would easily be over 100% of average for the date (continentally). PS, for summer this year, I am not looking for widespread coverage everywhere. I think a key metric to watch will be the Torngat Mountains and whether they retain more snowcover than they did in 2018 (a first from what I can tell in the satellite record). If they do and it is more widespread, it will be quite interesting to see if similar impacts from 2018->2019 extend from 2019 into 2020 in a more aggressive fashion.